Holidays for me are entirely bound up in my family’s traditions. What we eat, when we decorate, even how the decor looks is deeply meaningful to me. It’s also an at-home holiday for us, we hang out together (friends are very welcome if not required!) but we’d rather stay in eating our sugar cookies, rib roast (Christmas Eve meal) or special baked french toast breakfast (Christmas morning). One year we varied it up and went skiing in the Tirol of Austria, which was a great holiday, but the consensus of all the family afterwards that even though it was amazing, it hadn’t felt at all like Christmas. Jeff’s family has their own traditions as well, and it’s been really fun getting learn and incorporate a new set of them – particularly breakfast at a particularly wonderful diner and getting to enjoy the excitement of nieces and nephews of Christmas morning. For the four years we’ve been married we’ve been able to alternate Thanksgiving and Christmas with either family and it’s been a great compromise but this year…well, Thanksgiving turned out a bit unexpected. And as for Christmas, the Atlantic Ocean is not small and plane fare beyond us currently, plus we really like being in London! So Jeff and I have had a few discussions about the new phase we’re finding ourselves in about having to rely on ourselves to either perpetuate the traditions we want to keep and forge new ones for ourselves. We’re going to have to tweak this a bit over the next few years. I have to admit, it always feels slightly less Christmas-y without my parents, siblings, and friends around to spend hours playing games with, dinner at the big table, and lots of time and good conversation. But as for building new traditions for just the two of us, I wouldn’t mind an annual repeat of Saturday night! 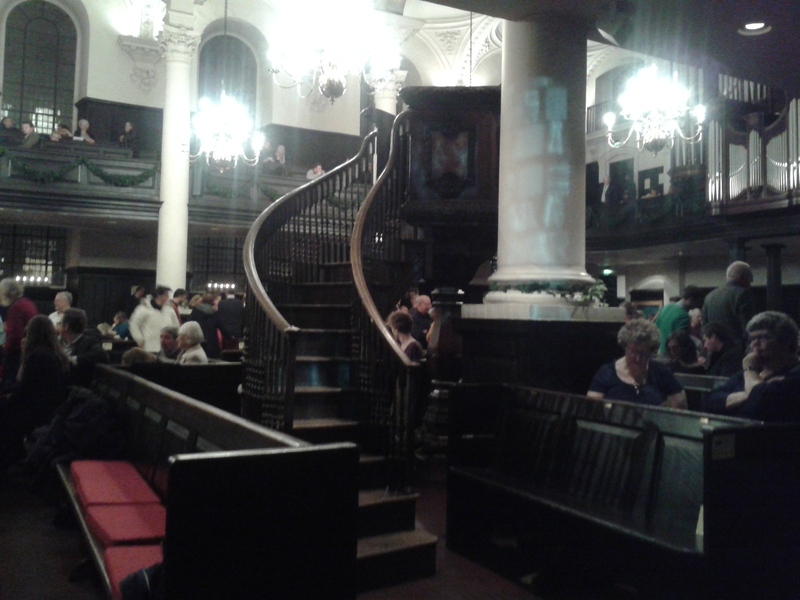 Feeling just a bit detached from Christmas this year, in spite of the gorgeousness of London in full holiday splendor, I booked us a couple of tickets for a performance of Handel’s Messiah at St. Martin-in-the-Fields church, which makes up a part of Trafalgar Square. Handel. 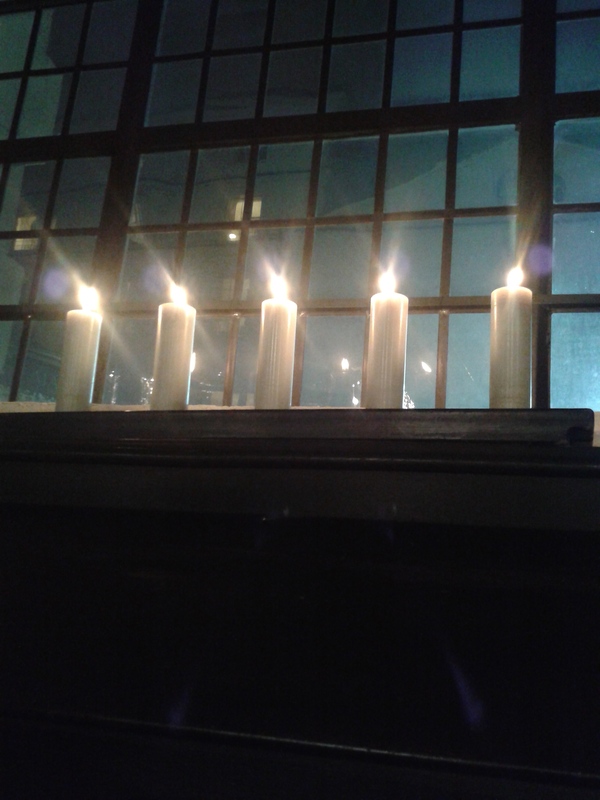 By candlelight. No way we were passing it up. St. Martin’s-in-the-Fields is an old church, it’s been around for nearly a thousand years, even though the present incarnation has only been around since the early 18th century when the building was discovered to be in desperation need of renovation. Plenty of significant people are buried there, and it actually serves as the parish church for the Royal Family, and Downing Street. Supreme Head and all that. It’s still very much in operation as a church, but in recent years it has cultivated a role for itself as a major hub of classical music support as well. It puts on regular concerts and performances throughout the year, including some free ones meant to be taken in during a lunch break or afternoon out and about. Jeff and I got dressed up and bundled against the wet and cold and took in an evening of the entire Messiah by candlelight. 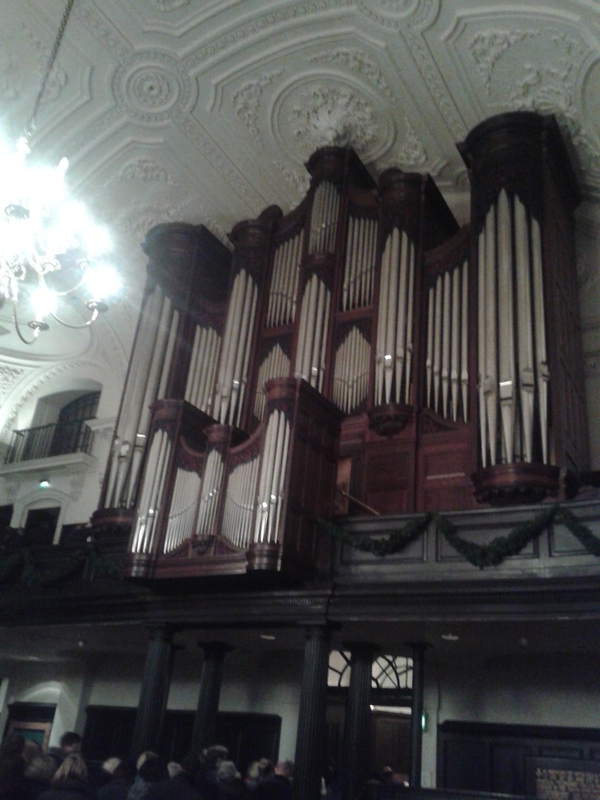 We had a beautiful view of the organ, lectern, and even the conductor and soloists from a side box pew. The setting was lovely (garlands and candles everywhere), the music was beautiful, and I for one came away feeling much more seasonal. Sometimes you just need to hear something unabashedly Baroque! It was a lovely way to gear myself up for this week – when we shall be attempting the formidable Rodgers family feast with just two people in the kitchen instead of the typical six minimum. Because new traditions are important, but some old ones are vital. Gorgeous photos! 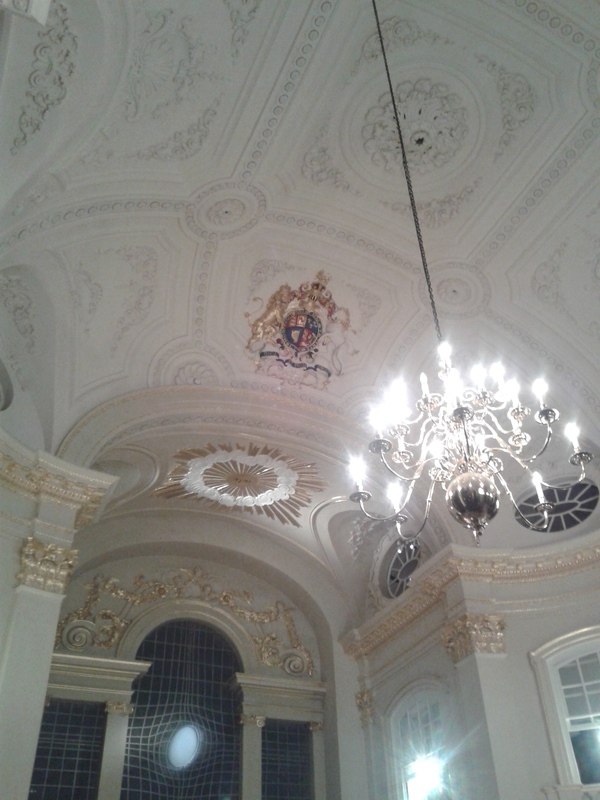 I love St Martin’s, the inside is so beautiful and sometimes you can hear musicians practicing outside the ‘proper’ gig. I’m so glad you had a good time! I love walking through Trafalgar and suddenly hear music floating about! We need to get more music into our “nights out on the town” rotation, I think, it really was a nice way to spend the evening. Stunning! My Saturday night was spent in a house in the woods in the rain in the Midwest. I need to up my game! That actually sounds…quite lovely. I’m missing my parents’ house in the woods right now, just a bit. Your game is solidly awesome. Thanks…I’m going to need it!